Play 3 rounds at one of America's finest 72-hole properties and get a 4th round FREE! Also receive a $15 Dinner Certificate to the Divine Dining Group. DISCLAIMER: Package price based on quad occupancy in a 2 Bedroom Golf Villa. 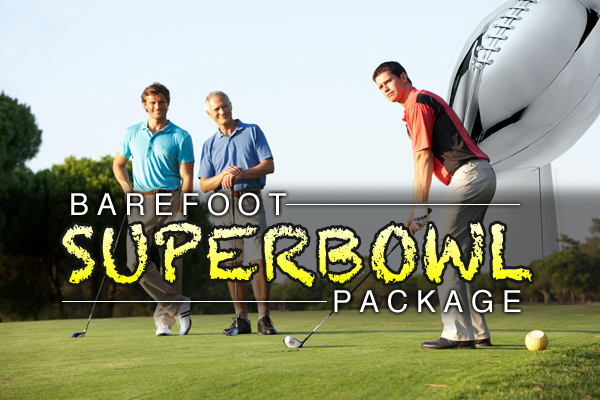 4th Night Free offer valid on Barefoot Golf Villa accommodations only. Dining voucher to Divine Dining Group is valid for up to $15 credit food purchase. Valid at Bubba's Fish Shack, Nacho Hippo, Pawley's Raw Bar, Ultimate California Pizza & UCP Game Zone locations only. No cash value & Not valid with any other offer. Offer subject to change without notice. Advertised price does not include tax and fees.